Impoverished fishermen along the coast of tropical African countries like Mozambique and Madagascar may have only a few more years to eke out a profit from one of their nations' biggest agricultural exports. Within a few decades, they may no longer have a livelihood at all. That's because swampy mangrove forests - essential breeding grounds for fish and shellfish in these countries - are being destroyed by worsening pollution, encroaching real estate development, and deforestation necessary to sustain large-scale commercial shrimp farming. The decline of these forests threatens much of Africa's coastal food supply and economy. The destruction of mangroves -- one of Earth's richest natural resources - also has implications for everything from climate change to biodiversity to the quality of life on Earth. Growing up in Cotonou, Benin, environmental scientist Lola Fatoyinbo of NASA's Jet Propulsion Laboratory (JPL) passed polluted mangroves daily. Inspired to help save the forests, she began a mission as a graduate student in the United States to gain more insight about African mangroves. Her studies have brought her back to Africa, where she has journeyed along the coastlines to test a new satellite technique for measuring the area, height, and biomass of mangrove forests. She developed and employed a method that can be used across the continent, overcoming expensive, ad hoc, and inconsistent modes of ground-based measurement. Fatoyinbo's approach recently produced what she believes is the first full assessment of the continent's mangrove forests. "We've lost more than 50 percent of the world's mangrove forests in a little over half a century; a third of them have disappeared in the last 20 years alone," said Fatoyinbo, whose earlier study of Mozambique's coastal forests laid the groundwork for the continent-wide study. "Hopefully this technique will offer scientists and officials a method of estimating change in this special type of forest." Mangroves are the most common ecosystem in coastal areas of the tropics and sub-tropics. The swampy forests are essential -- especially in densely-populated developing countries -- for rice farming, fishing and aquaculture (freshwater and saltwater farming), timber, and firewood. Some governments also increasingly depend on them for eco-tourism. The large, dense root systems are a natural obstacle that helps protect shorelines against debris and erosion. Mangroves are often the first line of defense against severe storms, tempering the impact of strong winds and floods. These coastal woodlands also have a direct link to climate, sequestering carbon from the atmosphere at a rate of about 100 pounds per acre per day - comparable to the per acre intake by tropical rainforests (though rainforests cover more of Earth's surface). 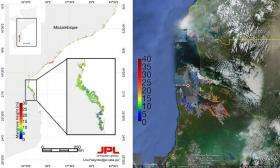 "To my knowledge, this study is the first complete mapping of Africa's mangroves, a comprehensive, historic baseline enabling us to truly begin monitoring the welfare of these forests," said Assaf Anyamba, a University of Maryland-Baltimore County expert on vegetation mapping, based at NASA's Goddard Space Flight Center in Greenbelt, Md. Fatoyinbo's research combines multiple satellite observations of tree height and land cover, mathematical formulas, and "ground-truthing" data from the field to measure the full expanse and makeup of the coastal forests. "Beyond density or geographical size of the forests, the measurements get to the heart of the structure, or type, of mangroves," explained Fatoyinbo. "It's that trait - forest type - that drives which forests land managers target for agriculture, conservation, and habitat suitability for animals and people." Fatoyinbo and colleague Marc Simard of JPL used satellite images from the NASA-built Landsat and a complex software-based color classification system to distinguish areas of coastal forests from other types of forests, urban areas or agricultural fields. They also integrated data from NASA's Shuttle Radar Topography Mission (SRTM) to create relief maps of the height of the forest canopy. Finally, they merged the broad radar maps with high-accuracy observations from a light detection and ranging (commonly called lidar) instrument aboard NASA's Ice, Cloud, and land Elevation Satellite (ICESat) to obtain accurate height estimates. Fatoyinbo double-checked the accuracy of her satellite measurements at the ground level in the only way possible: She went to Africa to measure tree heights and trunk diameters in person. Using a hand-held instrument called a clinometer and a simple trigonometry formula, Fatoyinbo visited Mozambique, measured the trees, and found she indeed had very accurate measurements of the forests. Mangroves are hardy and adaptable forests that can thrive under extreme heat, very high salt levels, and swampy soil. Rampant clearing for agriculture and construction, soil toxicity, and long-term oil and sewage pollution, however, are increasingly threatening their survival and more than 1,300 animal species in ways that nature cannot. "The United States' largest mangrove forests, Florida's Everglades, are largely protected now and recognized as an endangered natural resource," explained Fatoyinbo. "But in many other places, resource managers lack solid monitoring capabilities to counter mangrove exploitation. Better mangrove monitoring will, I hope, mean better management and preservation." Free satellite data can help ease the problems of money, logistics, and political instability that can prevent mangrove preservation. For that reason, Anyamba and Fatoyinbo are working to convince the United Nations Environment Program and the UN Educational, Scientific and Cultural Organization to include the study's data in their environmental assessments. The new technique also distinguishes itself, added Anyamba, "as an excellent example of how we can use different remote sensing technologies together to address science questions and global social issues."